In "Passage to India," Walt Whitman sings in wonderment at the sight of the Transcontinental Railroad. Envisioning himself a passenger, he hears the echoes of the whistle "reverberate through the grandest scenery in the world." The train brings Whitman to the mountains, plains, deserts and forests, whose images he uses to create a romantic portrait of the West that feels eternal. What the Transcontinental Railroad actually brought was change. By 1881, it was routine to travel by train from eastern cities like Boston, New York, Philadelphia, and Baltimore to San Francisco. The round trip that took Lewis and Clark two-and-a-half years in 1803 was now a nine-day journey. The consequences of this new technology were profound. Nothing in the West would ever be the same again. Analyzing archival material such as photos, documents, and posters, students can truly appreciate the phenomenon of the Transcontinental Railroad. They can begin to answer some important questions: Why was the Transcontinental Railroad built? How did it affect Native Americans? Other minorities? How was the environment affected? What were the advantages of railroad travel? Who used the railroads, and why? Who built the railroad? Help your class make connections between the arrival of the railroads and many of the changes occurring in the United States and its territories. Review each lesson plan and select the materials that you think will be useful. Download and duplicate as necessary any archival materials you will use, particularly those for Activity 3. For dramatic effect in Activity 3, create some large colorful arrows. Provide a way for students to post the documents used in Activity 3. This unit offers many resources for classroom use to enable teachers to choose those that are best suited to each class and to organize students efficiently. In Activity 3, for example, sufficient documents are listed to enable distribution to small groups or individuals as desired. Congress and the American West: The Transcontinental Railroad — A paragraph summary and four images of important documents. Available on The Digital Classroom. History of the Union Pacific Railroad — Four brief essays on the financing and construction of the Transcontinental Railroad. Includes links to photos, maps and other railroad-related sites. Available via a link from Internet Public Library. History of Railroads and Maps — A detailed look at surveying and mapping railroads during the period of Western expansion. See especially the section on the Transcontinental Railroad. Available on American Memory. Lesson Plan on the Transcontinental Railroad — For grades 6-12, with activities that could be adapted for younger students. Available on New Perspectives on the West. The handout for Group 3 lists some good resources on the role of Chinese immigrants; the handout for Group 4 lists good resources on the effect of the arrival of the railroad on Native Americans. To heighten student anticipation for learning about the railroads, share railroad-related poems and songs, or read a book aloud to the class. Carol Hurst's Children's Literature Page, a link from the EDSITEment resource Internet Public Library, offers many terrific suggestions on its Trains Page, including "Death of the Iron Horse," by Paul Goble, which tells of the arrival of the rails from the point of view of the Native Americans. Activity 2. When Is That Train a-Comin'? Where Is It Going? Share with the class an image of an 1881 Through Train Schedule, accessible via a link from the EDSITEment-reviewed website Internet Public Library. Give students the chance to review the schedule and make observations. Which cities were connected by the railroad? What information can be ascertained from the schedule? Which cities are served? Give the students a map of the U.S. on which they can indicate the cities being served and the connections between them. A printable map of the 50 states is available through the EDSITEment resource National Geographic Xpeditions. To emphasize the entry of new states into the Union after the growth of the railroads, students could use instead—or additionally, for comparison purposes—a map of the United States in 1880, available through a link from the EDSITEment-reviewed New Perspectives on The West. If desired, compare the 1880 map to a map from 1900 to demonstrate how many states were admitted to the Union in the interim. Transcontinental Railroad Lines, 1880s, a link from the EDSITEment resource The Internet Public Library. This map shows clearly the many connections from Chicago and other points in the East to points in the West, little more than 10 years after the completion of the Transcontinental Railroad. California Zephyr: Chicago, Ill., to Emeryville, Calif. (San Francisco, Calif.). Empire Builder: Chicago, Ill., to Seattle, Wash., or Portland, Ore.
Southwest Chief: Chicago, Ill., to Kansas City, Mo., to Los Angeles, Calif.
Activity 3. Because of the Train a-Comin'? The first three paragraphs of the essay The American West 1865–1900. Prepare copies of an appropriate number of the following documents, all accessible through EDSITEment resources. Distribute them among individual students or student groups as desired. (Note: The documents are listed here in approximate chronological order. Chronological order should be maintained as the documents are displayed to further highlight cause-and-effect relationships between different events.) As you assign the documents to groups or individuals, make sure that any that require reading (most are photographs) are distributed appropriately. Choose only those documents best suited to your class that demonstrate the various effects of the railroad's arrival. Captions provided (for example "Railway Post Office") should be shared with the students. The notes are for the teacher to aid in selecting documents and guiding discussion. Essay: Biography of Leland Stanford—1824–1893 Stanford's life extended throughout the railroad era. Some entrepreneurs became phenomenally wealthy as a result of the railroads. The wealth that was created helped spur investment in new technologies. Available on the EDSITEment resource New Perspectives on the West. Photograph: Pony Express Rider Circa 1861 Trains would soon replace horses as the fastest way to move mail over great distances. Available on New Perspectives on the West. Population growth in the West enabled the construction of the railroad. Necessary support services were provided in towns that grew up along the tracks. Once the trains actually arrived, they could bring more settlers, carry goods to market, and calm fears about the frontier as an inhospitable wilderness. Available on New Perspectives on the West. The Homestead Act and Railway Act, passed the same year, show how the U.S. government promoted and supported the construction of railroads. Available on New Perspectives on the West. Available on America's Library, a link from American Memory. Available via a link from the EDSITEment resource Internet Public Library. Mining became much more profitable once railroads could deliver the minerals to market. Available on New Perspectives on the West. The railroad was a more efficient means of transportation than the stagecoach. Available via a link from Internet Public Library. Note that the seller is the Union Pacific Railroad, and that the land being sold formerly belonged to Native Americans (Kickapoo Indian Reservation). Available via a link from Internet Public Library. The North's superior railroad resources helped it defeat the South in the Civil War. The potential for military control of the West was enhanced by the railroad. Available via a link from Internet Public Library. Towns sprang up along the tracks to support the railroads. Available via a link from Internet Public Library. Available on the EDSITEment-reviewed The Digital Classroom. 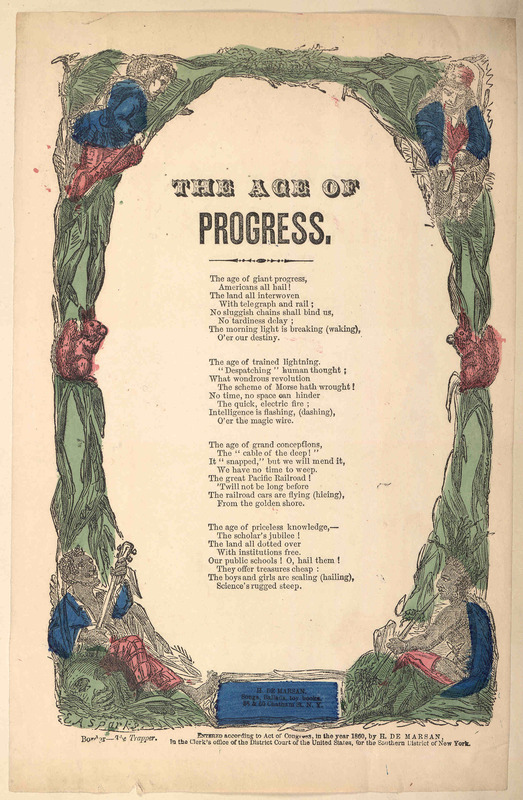 Timeline of selected events in business technology, media, marketing and advertising in the 1870s , available through a link from the EDSITEment-reviewed website Documents of Civil War Women. The railroad was creating a national market for goods that could now be shipped great distances economically. Towns were required to supply the needs of those associated with the railroad and those the railroad attracted to the West. Available via a link from Internet Public Library. Natural resources could be tapped more easily once the railroads had arrived. Natural resources were often used inefficiently. Available via a link from Internet Public Library. The wealth acquired through the railroad boom and the business ventures the railroads enhanced triggered a sharp increase in investments in the stocks and bonds of corporations. As businesses prospered, people eager to share in the profits invested heavily. Their investments provided capital that companies needed to expand. Available via a link from Internet Public Library. "Established in 1872, Dodge City began as a center of the buffalo trade, but after 1876, Texas cattle and cowboys were the town's economic mainstay. Dodge kept them coming up the Western Trail with a free-for-all attitude that soon made it one of the most violent towns in the West. Local farmers finally closed the area to cattle drives in 1885, and the 'Queen of the Cowtowns' passed into legend." From New Perspectives on the West. Photograph: "Trail of the Hide Hunters"
The railroad accelerated the demise of the West's great buffalo herds, and therefore the demise of the Native Americans who depended on the buffalo. Available on New Perspectives on the West. Railroads enabled the delivery of mass quantities of buffalo hides. Available on New Perspectives on the West. A decline in railroad building, the fear of competition for jobs, and prejudice based on race led to the exclusion of Chinese immigrants. Most Chinese immigrants were by this time refused entry to the United States. Available on New Perspectives on the West. The railroads meant that goods from almost anywhere could be delivered to your hometown. Mass production meant that goods could be produced in quantity; fewer goods were being made in the home. Available through a link from the EDSITEment resource Documents of Civil War Women. It is the student's or group's responsibility to describe the image or document. After it is described, each document should be displayed. When all the images have been revealed, challenge your students to create cause-and-effect connections based on the documents. Explain that railroads brought many changes and that significant change in one aspect of our society often has a "ripple" effect that changes other aspects. Give each group the opportunity to use photos and documents to create cause-and-effect ladders. The connections the students make are hypotheses based on the evidence at hand. The student(s) would say, "Because the railroads came ..." and then display Laying the Golden Spike, May 10, 1869. Then the student(s) would post an arrow pointing to the next image—Rath and Wright's buffalo hide yard, showing 40,000 buffalo hides baled for shipment. Dodge City, Kansas, 1878 and say, "Buffalo hides could be shipped to the East." The student(s) would say, "Because buffalo hides could be shipped to the East, hunters shot many buffalo," and then post an arrow and display Trail of the Hide Hunters, which shows buffalo lying dead in the snow in 1872, one with the hunter's rifle propped against its carcass. The student(s) would say, "Because hunters shot many buffalo, Native Americans who depended on the buffalo could no longer maintain their way of life" and then post an arrow and display Group of mounted Pawnee warriors. Students can show cause and effect using as few as two photos or documents, or as many as they can justify through their explanations. Proceed from one group to the next, as each makes a different cause-and-effect connection. Activity 4. Because of the Train a-Comin'! After the students have created their cause-and-effect ladders, they will work with the Timeline of Events in the West, on the EDSITEment resource New Perspectives on the West, for the 1860s, 1870s and 1880s to look for events that validate student cause-and-effect hypotheses suggested in Activity 3. Divide the class into six groups, each assigned events as shown on the timelines provided. (You will need Adobe Acrobat Reader to view timelines.) Make sure each group has at least one strong reader. Give the students time to look over the list. Proceed chronologically as each group names one or more events that relate to the building of the Transcontinental Railroad. Students should explain the connection based on the discussion in Activity 3. Further research on any of these events would make a good extension of the lesson. Students can read and complete the Interactive Activity for Alexander Curtis on the EDSITEment-reviewed website At Home in the Heartland Online. Have students conduct research on time zones. The operation of the Transcontinental Railroad required that a standardized national time system be established to insure that it was running on time. For an example of the problem that needed solving, look at the bottom of an 1881 Time Table, available via a link from the EDSITEment resource Internet Public Library. For more background information, visit America's Library: Time Zones, a link from the EDSITEment-reviewed website American Memory, or The World's Time Zones. Students can contrast the days of the early railroads with today's railroad operations. If students have had a chance to ride a train, they can start the comparison with their own experience. Many firsthand accounts of early travel on the Transcontinental Railroad are available via a link from the EDSITEment resource Internet Public Library. Students can track the construction of the Transcontinental Railroad in California and Nebraska with images available via a link from the EDSITEment resource Internet Public Library. Students can take a field trip to see model recreations of early railroads. Blumberg, Rhonda.Full Steam Ahead: The Race to Build a Transcontinental Railroad. Washington, DC: National Geographic Society, 1996. Coiley, John. Train. New York: Alfred A. Knopf, 1992. Hynson, Colin.The History of Railways. Hauppauge, NY: Barron's, 1998. Silverman, Jerry. Singing Our Way West: Songs and Stories from America's Westward Expansion. Brookfield, Conn.: Millbrook Press, 1998. List at least three effects the Transcontinental Railroad had on the regions through which it passed. Use archival documents to demonstrate the effect of the Transcontinental Railroad on the U.S.
Why was the Transcontinental Railroad built? Who built it? Who used the railroads, and why? What effects did the Transcontinental Railroad have on the U.S.?